Because it’s so full of delicious and flavorful toppings, there’s hardly any room for lettuce. Cheese, avocado, black olives and juicy meat — the best low carb foods thrown in a bowl and covered in dressing. 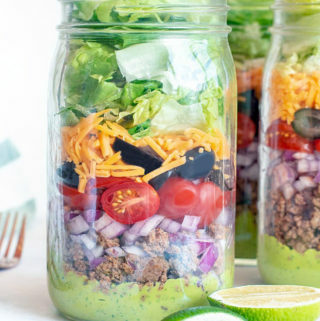 Keto taco salad is easy to meal prep and loved by all — so let’s do this thing! You’re gonna love how easy this caveman keto taco salad is to throw together — just chop up the low carb Mexican food ingredients you love and toss it all together! Low carb taco seasoning is a spice mix I simply can’t live without. I make a big batch and store it in a labeled jar so it’s always ready. This blend of zesty seasonings can turn a handful of low carb recipes from meh to amazing with a simple sprinkle! I know it’s always tempting to skip the extra step — but don’t skip the low carb taco seasoning! 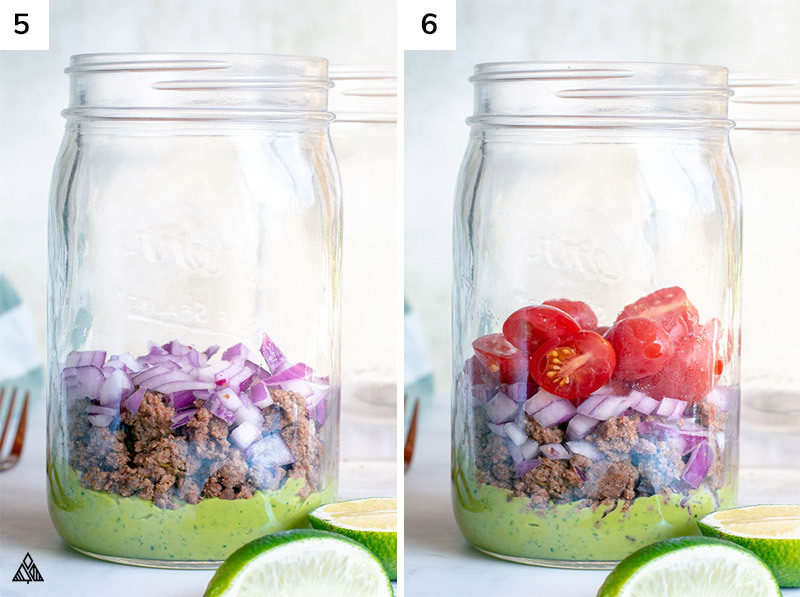 It’ll give the meat in your keto taco salad that saucy, rich and moist flavor we all love! And store bought taco seasoning is loaded in unnecessary carbs. Meat, chicken, ground beef, ground turkey, you name it! Low carb vegetables. Lettuce, tomatoes, and red onions add a ton of flavor! Fresh herbs, mint and cilantro. Cheese! 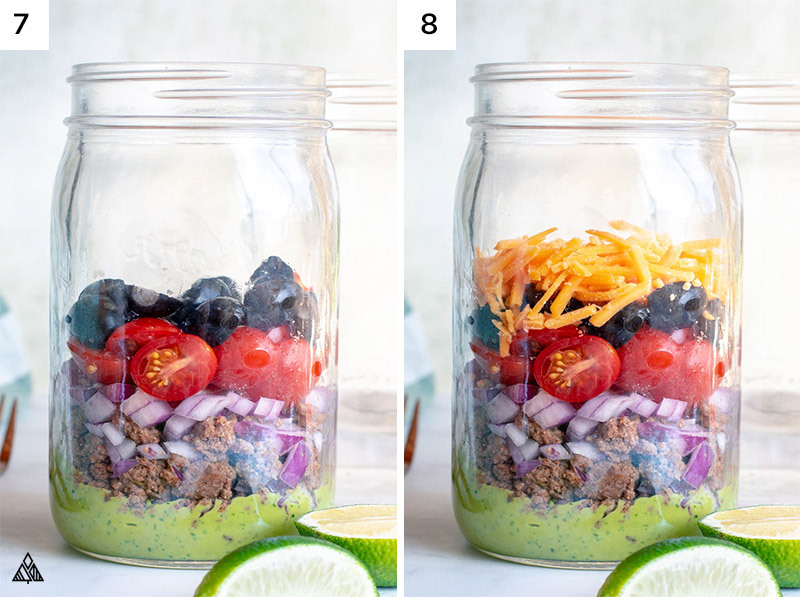 If you’re going for the rainbow effect, use cheddar — although I prefer pepper jack in my keto taco salad! Avocados. Instead of avocados I use my favorite avocado sauce, for some of that cilantro, garlic and sour cream action! Low carb nuts. Pepitas add a nice crunch and a decent amount of protein. Low carb salad dressing. Make your own (like this delicious keto ranch dressing), or read the label of store bought dressings to be sure it works with your carb goals. Taco Seasoning — if using store bought, watch out for cornstarch and sugar on the ingredient list! 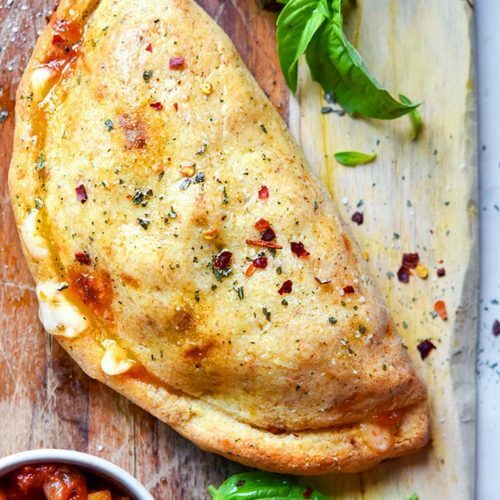 Since there are hardly any carbs in cheese, your favorite gooey treat can be melted into crunchy cheese taco shells! Similar to making cheese chips, form taco sized mounds of cheese on a baking sheet and crips up before layer with your keto taco salad ingredients. Alternatively, you can top your keto taco salad with a nice crunch of low carb taco shells chips. Same concept as above — use a pizza cutter to cut the melted cheese into thin strips. 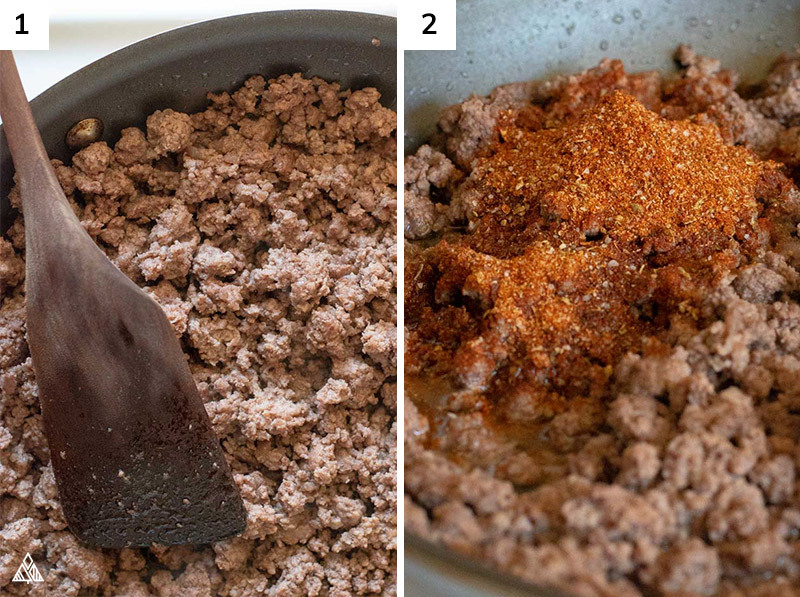 If you’re looking for some extra heat, get creative with your keto taco seasoning. Add more chili powder or red pepper flakes, heck work with some cayenne pepper instead! 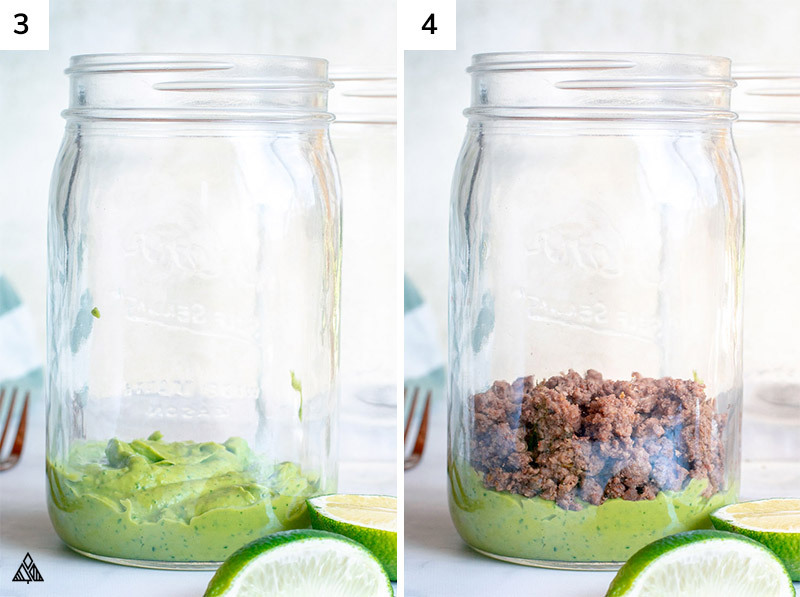 Your keto taco salad, your seasoning. Skip the lettuce and bake all these ingredients together into a keto taco bowl. Make a low carb taco salad bowl using chicken instead of the beef used in this recipe if you prefer! Are you ready to make your coworkers super jealous? 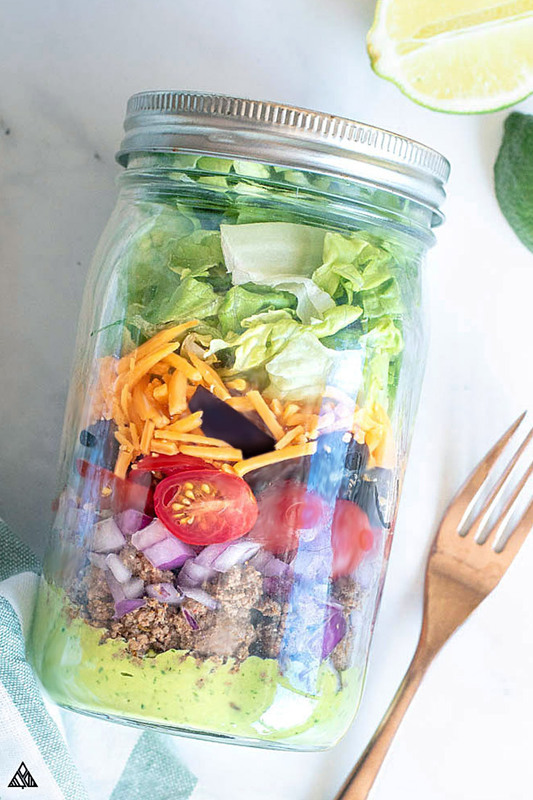 Then here’s an idea — layers this keto taco salad in a clear mason jar, for a colorful rainbow of taco ingredients without the keto taco shells! Package the dressing in a separate container, or place it on the bottom so the salad doesn’t get soggy. If you go too crazy with the toppings (like I do), bring a bag of lettuce and toss it all together in a bowl for lunch! 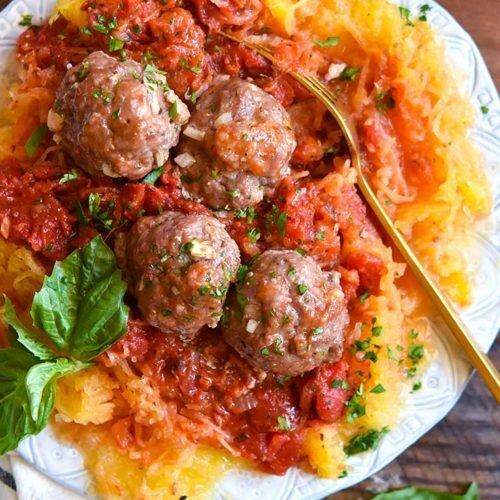 In less than 10 minutes, you’ll have awesome low carb meal prep for the whole workweek! If you have leftover meat, toss it in a labeled, resealable bag and into the freezer for future low carb salads. 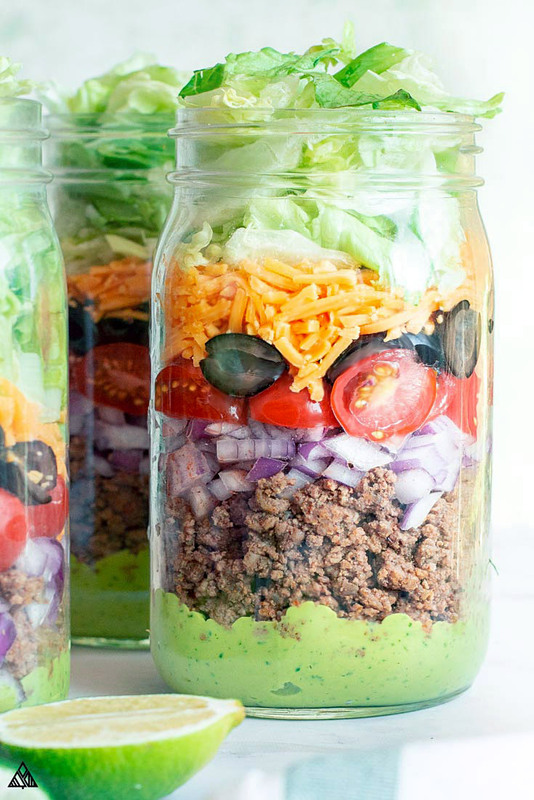 Let’s get shaking with this ridiculously delicious keto taco salad recipe! 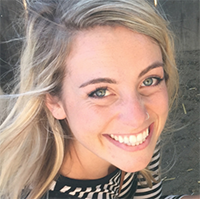 Let me know whatcha think in the comments below — Did you try any variations? How fantastic is this as meal prep?? 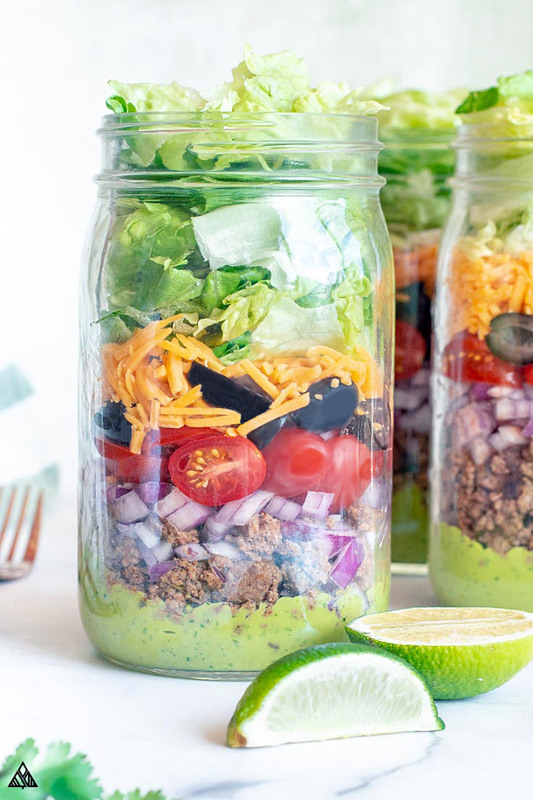 This keto taco salad is a recipe even veggie-haters can't resist — moist and zesty beef, sprinkled with low carb toppings and covered in a delicious avocado dressing. Brown beef to large pan and break up with a wooden spoon. Cook until no longer pink, then remove meat and place on a paper towel lined plate to absorb grease. Remove excess grease from pan. Add meat back to pan, with low carb taco seasoning and water and simmer (uncovered) for 15 minutes. Set pan aside and allow it to cool. If you’re serving this as a salad to eat immediately, place all ingredients in a large bowl. 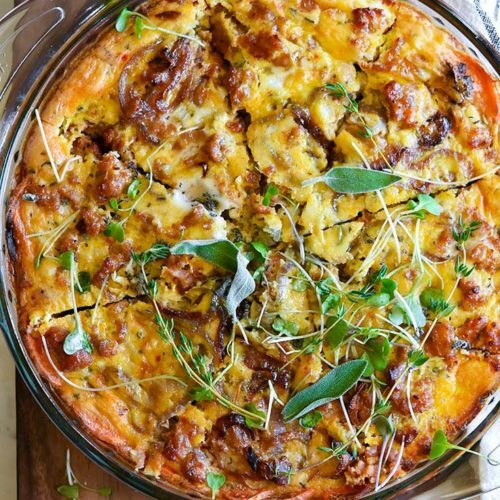 Once meat has cooled, add to the top and enjoy! 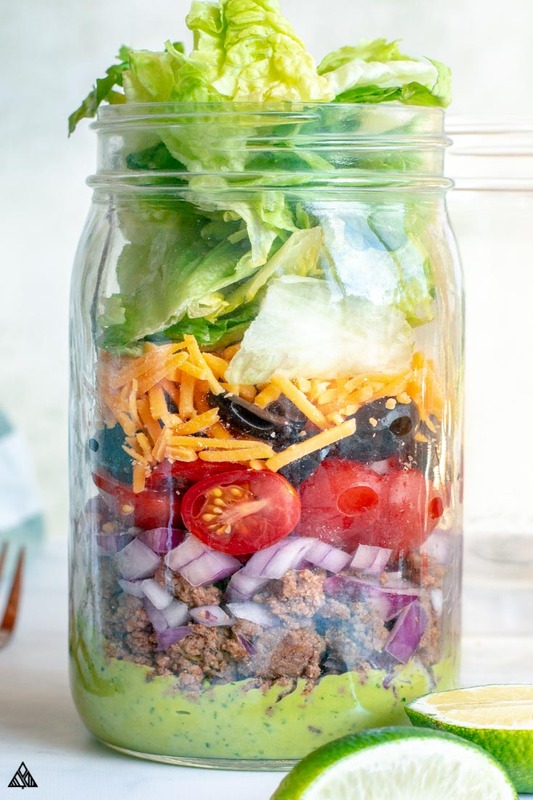 If you’re meal prepping this, add a layer of each topping to a mason jar (I was able to make 4 salad jars with these ingredients), adding the meat only once it has cooled completely. I went in this order: avocado sauce, meat, red onions, tomatoes, black olives, cheddar and lettuce). Enjoy! Use whatever meal prep containers you have on hand! Be sure to add sauce to the bottom, otherwise the lettuce will become soggy. If you’re looking for more protein, double the meat/seasoning/water and back a resealable bag of lettuce to serve the salad toppings over. There are few things more delicious than low carb Taco Bell — which can be hard to find in the sea of chalupas and crunch wraps — but once you know what to order, you’ll never look back — and in a pinch, Taco Bell keto taco salad is always there for you! Stay on track with this guide.